I so love the color combination of Red, White and Blue! The challenge at Crafting for all Seasons is to use red, white and blue on your creation. The Design Team out done themselves with this challenge and created some beautiful cards! 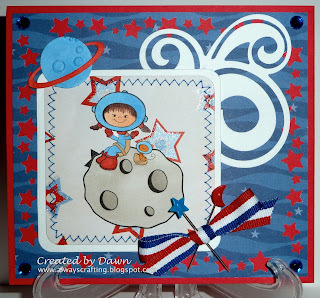 This card won at 2 cute rubber stamps challenge! Our sponsor this challenge is 2 cute stamps and we were given the cutest images to use. They were so much fun. Please check out their stamps HERE! Please go on over to the Crafting for all Seasons blog and enter your project today! Love it. So you colored that image. I'm in awe, it looks perfect. Love the pins you added! Super duper cute! Love that image! Thanks for joining us at Use It Tuesday this week!! Aww Dawn, this card made me smile!She's just too cute! Thanks for playing at The Crafty Pad this week! Gorgeous card, thanks for joining in with us at The Paper Shelter, this week. Cute card. Love the colors. Love that cute image and all the fun elements. Thanks for sharing with us at TT this week. OMG, that is so cute. thanks for sharing it with us at Cupcake Inspirations. Oh my gosh this is SO cute!!!!! Thank you so much for joining us at Cupcake Inspirations this week! Dawn, WOW, what an amazing card. Thanks for playing at 2Cute! Such a sweet sweet card! Great job! Thanks so much for joining us in our "Summer Theme and/or Red, White & Blue” challenge at Craft Us Crazy and hope you will join us again! LOVE how you finished this off with the red and blue stick pins! Perfection. Thank you for sharing this with 2 Cute Rubber Stamps. This is cute! nice image colors and ribbon. TFS with us at Cupcakes Inspiration this week. Wonderful card and great image. thanks for sharing at Delightful Challenges.